This Coyote quiver is made from a full coyote pelt and hung from a real stone arrow made in the old way. 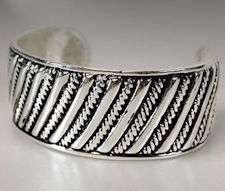 It is trimmed with authentic, long buckskin fringe, brass or silver beads and cones, glass crow trade beads, and feathers and has a braided buckskin shoulder strap. Matching decorative bows and arrows are sold separately. Add a matching beaded bow to this quiver, and we'll throw in two beaded arrows for free. The picture shown is representative. This is a one-of-a-kind handmade item, so the one you receive might vary slightly from the one shown. Please allow one to two weeks construction time, in addition to shipping time for delivery of this product. It is shown with Bronze Turkey Tail feathers, gold buckskin, and brass beads. However, this quiver is also available with different feathers, different leather colors, and either brass or silver colored beads. Use the drop down menus below to specify your preferences. If you would prefer the beads on the fringes in a different color, leave a comment in the comment box on your checkout form. 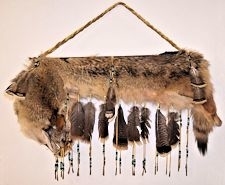 We have all the colors shown in our crafts section This coyote quiver can be shipped internationally.However, feathers cannot be imported to New Zealand. We can leave the feathers off by request. This product was added to our catalog on 12/16/2014.